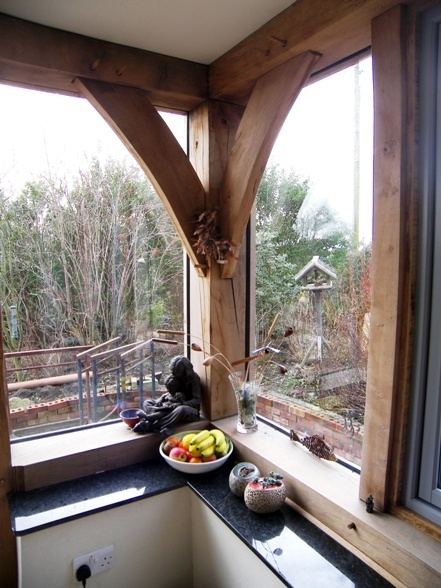 The glazing of green oak frames has in recent years become very popular and certainly makes for very interesting living spaces, but it is made rather difficult by the timbers inevitable movement as they dry insitu. 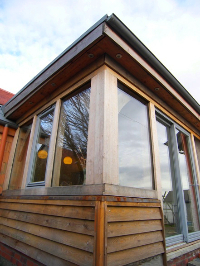 The problems this movement presents are not insurmountable as long as the timber for the structural frame has a higher, more stringent specification than it requires for general framing, and the glazing is applied by skilled professionals experienced in the use of green oak,following a well tried and tested system designed for the purpose. 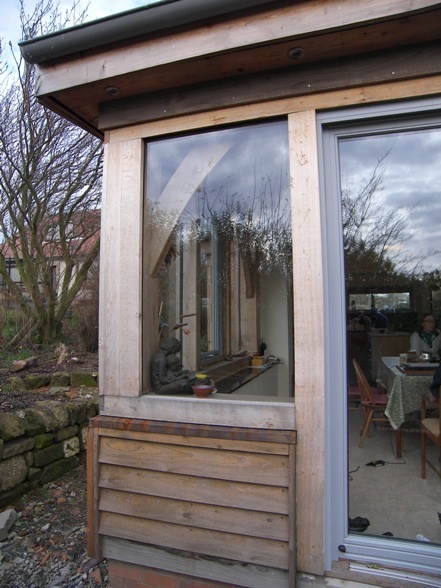 I usually use a dry glazed system which has become the industry standard, which follows a Scandinavian drained and vented model, and involves double glazed units fixed to the outside of the timber frame by way of air dry oak coverboards. All the photo's on this page show variations of this coverboard system. 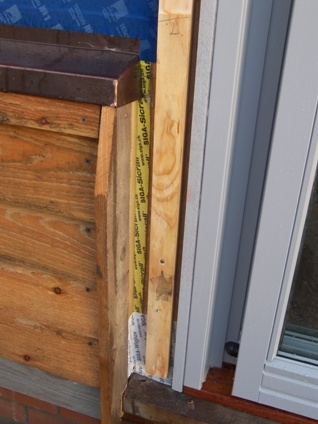 It is the most reliably weather tight method and should always be specified in exposed locations, but it does mean the actual frame is not visible on the exterior of the building. 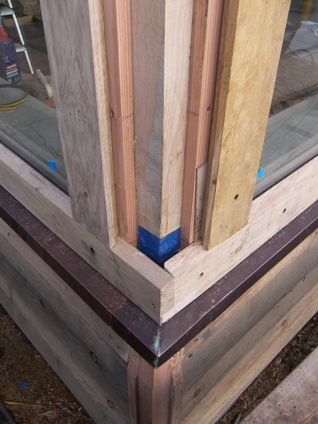 There is another method that leaves the ac tual structural frame visible on the outside, with the glazing set back a little from the face. 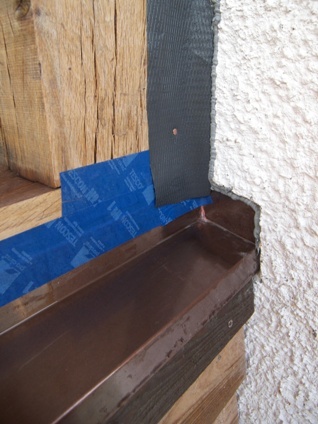 This method involves rebates and a silicone bedded glazing unit held in place by beading. The aesthetic effect is preferable to some people, particularly those who want a more traditional medieval feel, however in Scotland the lack of this particular more gothic vernacular and of course the much higher incidence of strong winds in many locations usually means the coverboard system is the one chosen in the end. In either case I can usually glaze the frames I supply, should it be required, but I will not usually glaze onto frames that have been supplied by other companies. Alternatively I would suggest Black Pig Frame Finishing a specialist company from England who will come north with pleasure (and who have a very informative website). The final option (to be approached with caution) may be for a local joiner to undertake the work as I can supply basic concept details of the build-up for the coverboard system. I would caution that there is a tendency for people unfamiliar with the method to underestimate the amount of time that it takes to complete the work, it’s a deceptively tricky business, and the amount of hand holding and advising I will be able to do is fairly limited. This final option, though it comes with its own risks, should not be discounted if there is a known and trusted tradesman available. 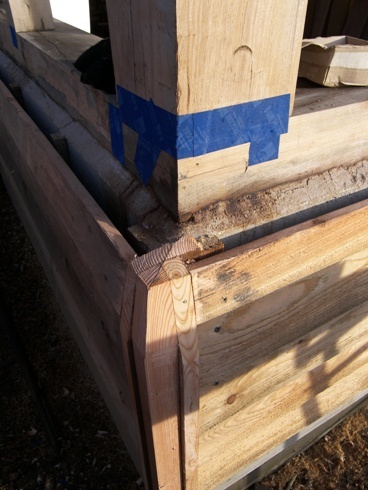 Remember that the 'glazing quality' timber for the frame would still have to be specified before the start of carpentry. 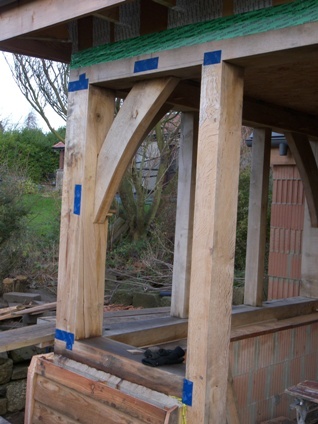 Glazing a green oak frame can be very expensive! 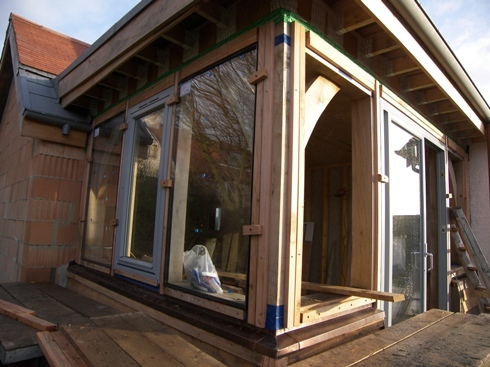 If the project is for a fully glazed structure it is not uncommon for the cost of the glazing to approach or even exceed the cost of the frame, so it is worth taking this into consideration at the design and budgeting stage of the project. 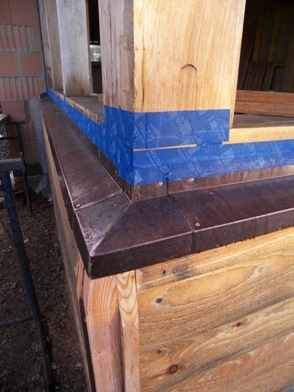 It is best to use copper for any flashings as lead can be slowly rotted by the acids in the oak runoff which can sometimes result in leaks. This acidic tannin runoff will also stain any masonry or renders on the walls below with brown streaks and tide marks. These are rather shocking when seen for the first time but are relatively short lived, usually disappearing by the end of the first year. 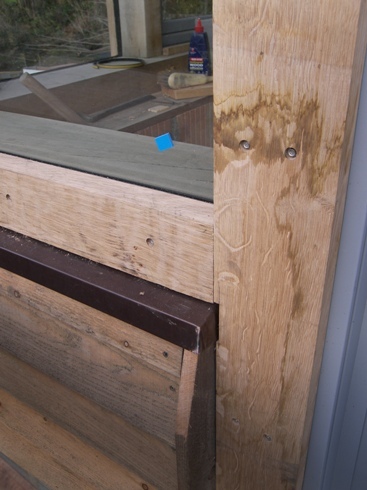 Windows and doors have to be ordered from a joinery company with full frames, as opening elements can not be hinged directly to the green oak. The best method is to install them using the same system as the glazed units, which will reduce any potential problems arising from the movement in the oak. The windows & doors need to be fitted at the same time as the rest of the double glazed units are being fixed so they all need to be available on site when the glazing visit is due (The framer is usually responsible for the actual hanging of the doors and windows for the same reason).